My apologies for the lack of postings. Although I still reviewed the decisions, I found a lot of the same rejections and arguments. That being said, I find this decision worth reporting on because the Applicants argued that software code in itself constitutes patentable subject matter under in Eolas Techs., Inc.v. Microsoft Corp. It should be no surprise that the Board disagrees. The claims at issue were directed to automatically generating and building (automating the generating and building of) dimensional models utilizing simplified analysis heuristics. The application included both system and method claims. an automated model building system for automatically constructing the dimensional model defined by the automated structure labeling system. The Examiner rejected claim 1 and others under 101. The applicants argued using the old State Street standard. In addition they argued that the claims are directed to software code that in itself constitutes patentable subject matter as described in Eolas Techs., Inc. v. Microsoft Corp. Techs., Inc. v. Microsoft Corp. case. Appellants, quoting a single sentence in Eolas, assert that Eolas stands for a new rule that software in itself is patent eligible. We do not agree – Appellants misconstrue Eolas. Eolas states that “[w]ithout question, software code alone qualifies as an invention eligible for patenting under these categories, at least as processes.” Eolas Techs., Inc. v. Microsoft Corp., 399 F.3d 1325, 1339 (Fed. Cir. 2005) (citing In re Alappat, 33 F.3d 1526 (Fed.Cir.1994); AT&T Corp. v. Excel Communications, Inc., 172 F.3d 1352 (Fed. Cir. 1999) (abrogated by Bilski, 545 F.3d 943)). In particular, we note that the quoted language in Eolas is dicta within a discussion of “whether software code made in the United States and exported abroad is a ‘component[ ] of a patented invention’ under section 271(f).” Eolas, 399 F.3d at 1338-39. Software in itself, with no structural tie to an article of manufacture, machine, process or composition of matter, is not patentable subject matter. See In re Nuijten, 500 F.3d 1346, 1357 (Fed. Cir. 2007) (A claim directed to computer instructions embodied in a signal is not statutory under 35 U.S.C. § 101). Cf. In re Lowry, 32 F.3d 1579, 1583-84 (Fed. Cir. 1994) (a claim to a data structure stored on a computer readable medium that increases computer efficiency held statutory). Patentable subject matter must fall within one of the categories set out in § 101. See FN 4 (supra). “Those four categories define the explicit scope and reach of subject matter patentable under 35 U.S.C. § 101….” Nuijten, 500 F.3d at 1359. Software (a data processing program) alone does not belong to one of those categories. I, for one, am looking forward to hearing what the Supreme Court says regarding Bilski. In this decision, the Appellants were able to overcome a 101 rejection by "communicating" information between a master device and a slave device. The claims at issue relate to bonding 'slave' devices, such as media capture devices, and instructing the devices to communicate captured media files with a specified set of metadata included. communicating, from the master device to the bonded device, media file transfer parameters, including definition of the media file metadata that is to be included with a captured media file. communicating a plurality of media files from the one or more bonded devices to the master device, the plurality of media files having metadata information as defined by the predetermined media file transfer parameters. The steps of claims 14 and 24 are performed by a master device or a bondable/bonded slave device. As argued by the Appellants, for example, the independent claims include 'communicating information between the master device and the bonded device.' Therefore, the methods recited in independent claims 14 and 24 are each tied to a particular machine or apparatus. I wanted to thank the followers of this blog who attended my webcast today on "Beating Bilski." I hope you found it useful, informative, or at least worth the hour of your time. My apologies for the delay in posting on this decision. My thanks go out to Aaron R. Fiegelson of the 12:01 Tuesday Blog for getting this decision out the day it was available. At the outset, it is important to note that the claims at issue in this decision are system claims. Based on this, it's clear the board was dealing with a "system" that implements some mathematical function. More specifically, the claimed DSL system is "configured to" provide to provide the claimed power spectral density mask. The Examiner rejected the claims under 101. The Examiner reasoned that claims 1-28 recite nothing more than a non-statutory mathematical algorithm or equation of a DSL communications system that has no practical application. In first finding the claim was actual a system claim, the Board found the preamble limiting. Next, they relied on the specification to determine that a DSL system includes: (1) a remote ADSL Terminating Unit (ATU-R) in bi-directional DMT communication with the a central office ADSL Terminating Unit (ATU-C) or (2) a central office High Speed ADSL Terminating Unit (HSTU-C) in bi-directional DMT communication with a remote High Speed DSL Terminating Unit (HSTU-R). Using this, the Board found that the claim was a system claim and thus within one of the four statutory categories. The recited communications system is a particular machine that transmits data on a digital subscriber line. The claimed machine is, therefore, tailored to DSL applications. 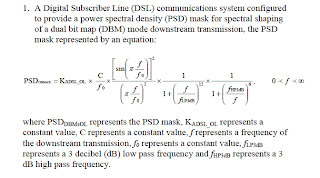 Moreover, the recited DSL communications system is programmed or configured to provide a PSD mask for spectral shaping a DBM mode downstream transmission defined by a specific equation. Thus, the recited DSL communication system is not a general purpose computer but a particular or special purpose machine. In the end, it appears that the panel was convinced that claim 1 did not pre-exempt “the use of any apparatus employing the combination of mathematical calculations recited.” Said another way, it appears that the Board was impressed with the fact that claimed PSD could be used in other communications systems and applications. It appears that Board took the view that claims at issue only cover DSL systems.